For some kids, drawing is their thing. Whole forests are razed to produce enough paper to keep up with their insane rate of creation. Other kids like to build, dismantle and tinker. For all the objects in the house taken apart in the name of learning, at least parents can puff their chests with pride at the little engineer growing up in their midst. It’s good to encourage them in their strengths, so for kids who have a knack for creating in 3D, there’s the Bob the Joint collection by Italian company, Brighello. 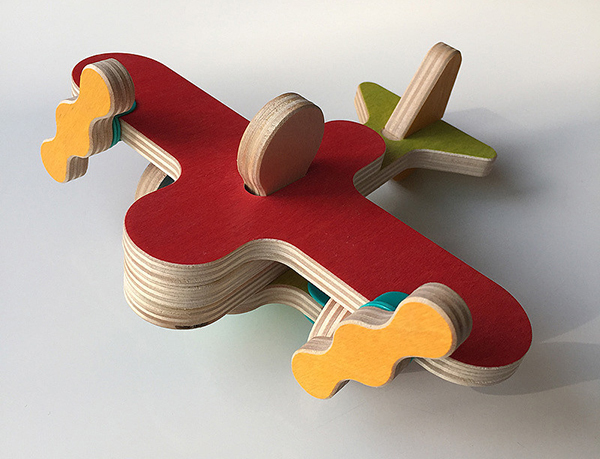 Created in partnership with an architecture and design studio, Bob the Joint is a collection of toys beautifully crafted from birch plywood, sanded to a satin finish and stained in muted colours. There’s a propeller aeroplane (£15), and a Spider racecar (£14), but the pièce de résistance of the collection is a sleek container ship (£18) with its multi-coloured cargo. The wooden pieces of each set stack and fit together, all held fast by a single pin named Bob. The toys help kids develop their fine motor and problem solving skills. That they inspire an early appreciation for elegant Italian design doesn’t hurt either. Bob the Joint is available from Toyella. Shipping starts from £8 pounds.